GEOLOGIST SEAMOUNTS, Hawaii – The turquoise waters became darker and darker, and squiggly glow-in-dark marine creatures began to glide past in the inky depths like ghosts. The three-man submarine went down, down, down into the abyss and drew within sight of something no human had ever laid eyes on: Cook seamount, a 13,000-foot extinct volcano at the bottom of the sea. Scientists aboard the vessel Pisces V visited the volcano earlier this month to examine its geological features and its rich variety of marine life, and an Associated Press reporter was given exclusive access to the dive. It was the first-ever expedition to the Cook seamount by a manned submersible. Among other things, the researchers from the University of Hawaii and the nonprofit group Conservation International spotted such wonders as a rare type of octopus with big fins that look like Dumbo’s ears, and a potentially new species of violet-hued coral they dubbed Purple Haze. Conservation International hopes to study 50 seamounts, or undersea volcanoes, over the next five years. During the Sept. 6 dive, the submarine splashed into the water, and as it dove, the only sounds were radio communications from the surface, the hum of an air scrubber that removes carbon monoxide from the passenger chamber, and the voices of the crew. The thick, hot tropical air inside the steel sphere became cooler and drier as the submarine descended. Halfway to the volcano’s summit, which is 3,000 feet below the surface of the Pacific, no sunlight penetrated. The only light that could be seen from the submarine’s face-sized windows was the bluish glow of the vessel’s own bright lights. Occasionally, bioluminescent creatures drifted past in the darkness. Stone and subpilot Terry Kerby, who helps run the Hawaii Undersea Research Laboratory at the University of Hawaii, watched as the volcano and its rugged basalt walls hundreds of yards high came into view. Seamounts are either active or dormant volcanoes that rise dramatically from the bottom of the ocean and never reach the surface. They are hotspots for marine life because they carry nutrient-rich water upward from the sea floor. Seamounts are believed to cover about 18 million square miles of the planet. Cook, situated over 100 miles southwest of Hawaii’s Big Island, is part of a group of undersea volcanoes known as the Geologist Seamounts that are about 80 million years old and could hold many new animal species, as well as elements such as nickel and cobalt that mining companies could extract. Within minutes of the vessel’s arrival at the summit, life began to appear — a starfish clinging to a rock, joined shortly after by eels, sharks, chimaera (also known as “ghost sharks”), shrimp, crabs and two rare Dumbo octopuses. One of the octopuses changed color from white to pink to reddish brown as it swam by. Several types of deep-sea corals were found along the seamount’s cliffs, including a vibrant purple one. 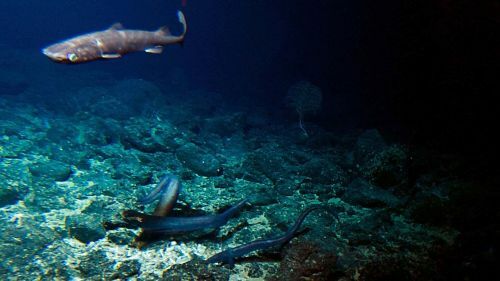 Two other seamounts were studied over three days of expeditions: McCall, home to a large number of small deep-sea sharks, and Lo’ihi, an active volcano. Lo’Ihi has been extensively surveyed by manned submersibles over the past 30 years. The past few times Kerby was there, he saw a large Pacific sleeper shark lurking about the volcano’s crater. The team also saw 6-foot eels and a number of new geological formations around the crater. Scientists say Lo’ihi is likely to someday become the newest island in the Hawaii chain as volcanic activity pushes the summit upward.